While you can always choose where to save files that you create, your computer settings include default save locations for your Desktop, Documents, and Pictures files. 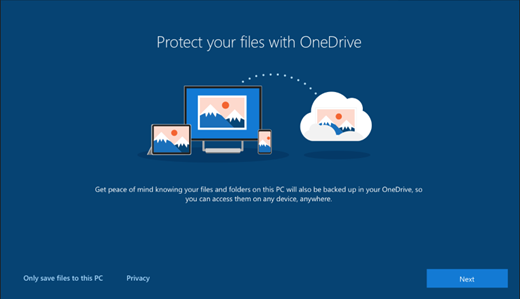 During Windows 10 setup, you should have seen a “Protect your files with OneDrive” screen telling you about the benefits of saving your files to OneDrive. If you clicked Next, you set up OneDrive as your default save location. If you clicked the “Only save files to this PC” option, you set up your PC as the default save location. You can change this default save location any time. Whether you save by default to your computer or to OneDrive, all your files are available on your PC. 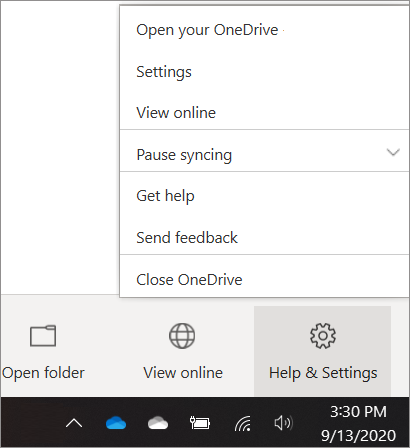 The OneDrive app built in to Windows 10 synchronizes your files between OneDrive and your computer, so they're backed up, protected, and available on any device. You can use Files On-Demand to free up space or to make sure files or folders are always available on your device, even when you're offline. Tip: To move a file between a folder in your PC and a folder in OneDrive, use File Explorer or the OneDrive app to drag the files where you want them. You can change your default save setting any time. Use the OneDrive app settings to change where your files are saved by default. Select the OneDrive cloud icon in the notification area, at the far right of the taskbar. Note: You might need to click the Show hidden icons arrow next to the notification area to see the OneDrive icon. If the icon doesn't appear in the notification area, OneDrive might not be running. Select Start, type OneDrive in the search box, and then select OneDrive in the search results. On the Auto Save tab, under Protect your important folders, select Update folders and follow the instructions to protect your files by saving them to OneDrive. No matter which default setting you choose, you still can select the save location you want each time you save a file. When you click Save for new files or Save As for existing files, click OneDrive or This PC and then pick a folder to save your file to. Important: If you stop protecting a folder, that folder on your PC may suddenly look empty. This is because the Desktop, Documents, and Pictures folders exist both under This PC and OneDrive, which might make them easy to mix up. When you stop protecting a folder, existing files stay in OneDrive and new files save to your PC. To learn more about moving OneDrive folders, read how to sync your Documents, Pictures, and Desktop folders with OneDrive. Learn how to sync OneDrive files without taking up disk space on your PC with Files On-Demand.